President Stroble and Provost Schuster rejoin Global Leadership Academy fellows for their Fall 2016 session. Note: This post is updated throughout the fall week of GLA activities. 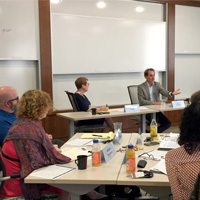 The final week together for the 2016 cohort of Global Leadership Academy opened with the president and provost hosting a frank and open discussion of the fellows’ GLA experience and questions they had for administrative leaders. The fellows discussed the privilege of being part of the Academy and the great responsibility they now have going forward to continue to improve the University for the benefit of our students. President Elizabeth (Beth) J. Stroble and Julian Schuster, Webster's provost, senior vice president and chief operating officer, spoke of Webster’s international scope and the pragmatic reasons that contributed to Webster’s original decision to begin expanding with global campuses, as well as U.S. metro and military campuses. Discussion ranged from current challenges and potential opportunities with the fellows benefitting from the high level view of making decisions with leadership and strategic planning. The GLA sessions over the first two days included presentations from deans Eric Rothenbuhler (School of Communications), Jenny Broeder (College of Arts & Sciences) and Brenda Fyfe (School of Education), and leaders from Global Marketing and Communications (GMC), Finance and Administration, Enrollment Management and Student Affairs (EMSA), Faculty Senate, Military campuses, and more. Leaders from different parts of Webster speak to the Global Leadership Academy cohort and lead discussions throughout the cohort's final week together. The academic deans spoke of the biggest challenges and rewards in their leadership roles and how they build community within their schools and colleges. The GLA program is designed so that fellows hear from deans for each of the five schools and colleges throughout the year. Fellows also heard from leaders in marketing, recruitment, retention and student services. Michael Cottam and Michelle Loyet of the Online Learning Center (OLC) gave an overview of students in the online programs. They shared strategic initiatives that the OLC is undertaking to support and retain students and develop new online programs, and how the OLC staff is approaching these initiatives using design-thinking methodology. 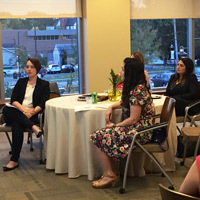 Rob Parrent, vice president for EMSA, spoke of how the job of recruiting prospective students is a team effort involving everyone at Webster -- a message tailored for a GLA cohort that includes fellows from many different units and locations across Webster. Ted Hoef, dean of students, shared theories on retention and then some of the concrete actions Webster is taking to increase retention numbers see our students successfully graduate. He discussed the research about issues that are the biggest threat to students persistence and the role everyone at the university plays in creating the sense of community that engages students more deeply with the institution. Rick Rockwell, chief communications officer and head of GMC, ran the fellows through an exercise to experience the process Global Marketing and Communication undertakes to try to capture the essence of Webster for marketing purposes. He talked about the goal of GMC to drive desires and interests in Webster among prospective students. 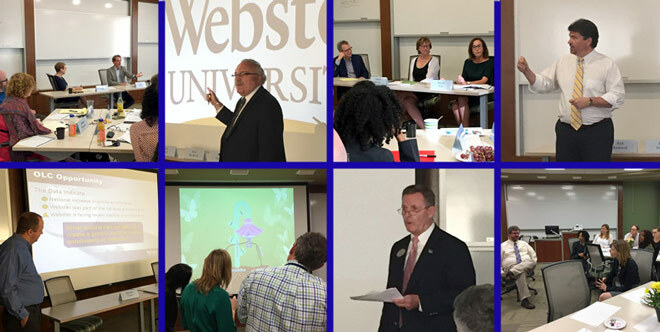 On Monday evening John Buck and Jennifer Stewart presenting on the Webster LEADS program with two LEADS students, Brittany Merchant and Angela Karas, presenting their leadership models. On Tuesday morning Ana Karaman, chief financial officer, joined the fellows to talk about Webster’s financial situation and her observations as a new leader at Webster. After lunch, the fellows heard from Sean Coleman and Jason Blakemore about how Webster serves the needs of our 4,400 military, veteran, or military-family students. Coleman shared the current state of Webster’s military campuses and the challenges and opportunities that the future holds with respect to our relationship with the military. Gary Renz and Basiyr Rodney spoke about the Faculty Senate and how the faculty contribute to shared and inclusive governance at Webster University. The fellows wrapped up another long day with a workshop on the Four Frames of Leadership led by Laura Rein and Holly Hubenschmidt. 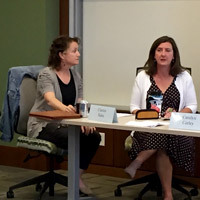 On Wednesday morning the fellows heard from Advancement's Charlie Hahn, Carolyn Corley and Linda Dahlgren on "From Vision to Results: Teaching and Research at Webster." The office recently celebrated their role in securing two federal grants totally more than $1 million for recruiting and teaching students in the sciences at Webster. With so many presentations and discussions from different parts of the university, there is a lot for fellows to process. Each morning during the three weeks per year when a GLA cohort is together, they typically have a reflective discussion period over breakfast to reflect upon and share further thoughts about what they've experienced during the week. The week ahead includes further work on their own leadership development and formal presentations by the fellows, insights from the St. Louis Metro extended campuses, and a visit Scott Air Force Base for military campus and student perspectives, among other activities. The Global Leadership Academy (GLA) at Webster University helps build the distributed leadership that is critical to Webster’s success. President Beth Stroble and Provost, Senior Vice President, and Chief Operating Officer Julian Schuster created the Global Leadership Academy to develop talent within the University that is essential for achieving its vision.